It’s not a mistake that Hawai’i has ~16 observatories. It’s dark here. Get outside of the cities and you’ll find a blanket of stars unlike anything you’ve probably seen before. 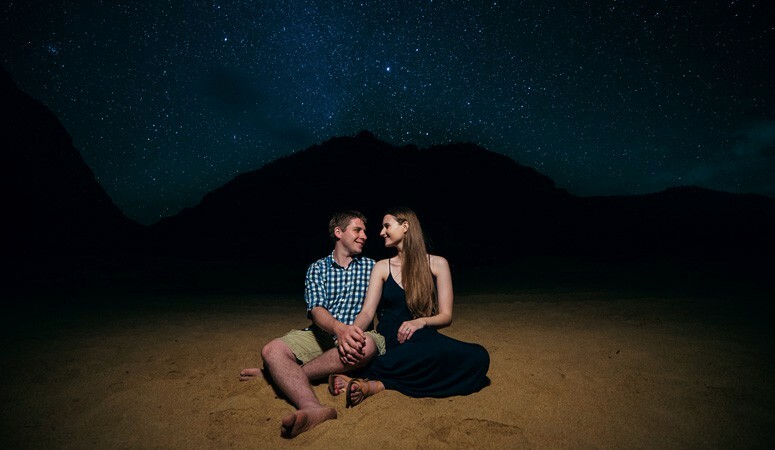 Stargazing can be a romantic adventure to share with your beloved. Alone, with the stillness of the universe around you, holding each other. Yeah, it’s a pretty fantastic way to spend some of the night. A recent study said 80% of American’s couldn’t see the Milky Way due to light pollution. We’ve lost the ability to stare into the void of the night sky and watch it come alive with billions of stars. Not so in Hawaii. 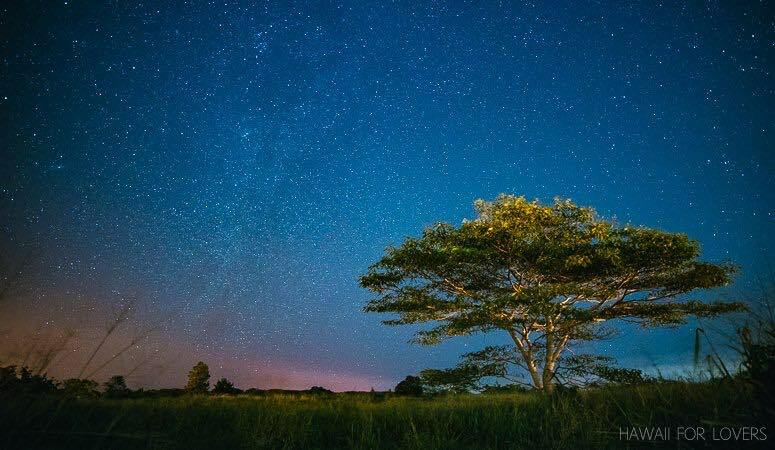 Below are some tips to really seeing the stars and the Milky Way when you come to visit Hawai’i. 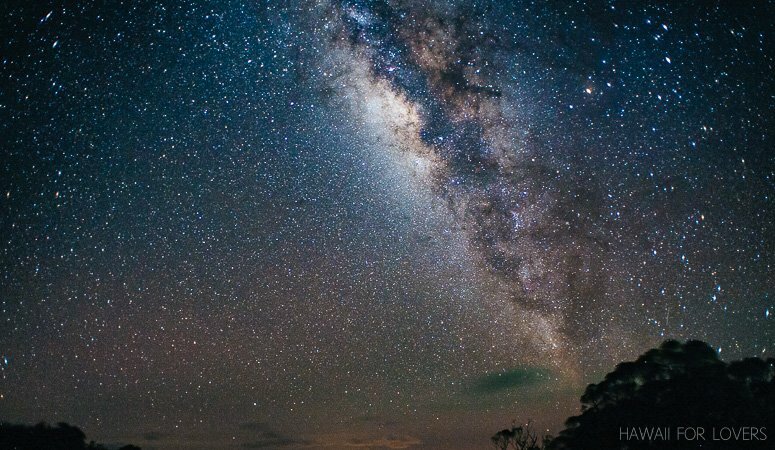 Sure, you can just take a walk and enjoy what you see, but hopefully, these tips will give you a greater chance to see beauty of the heavens above. That’s not hard to find in Hawai’i, but it depends on the island. Take a look at this map from lightpollutionmap.info (head to the site to zoom in and around for a more detailed look). 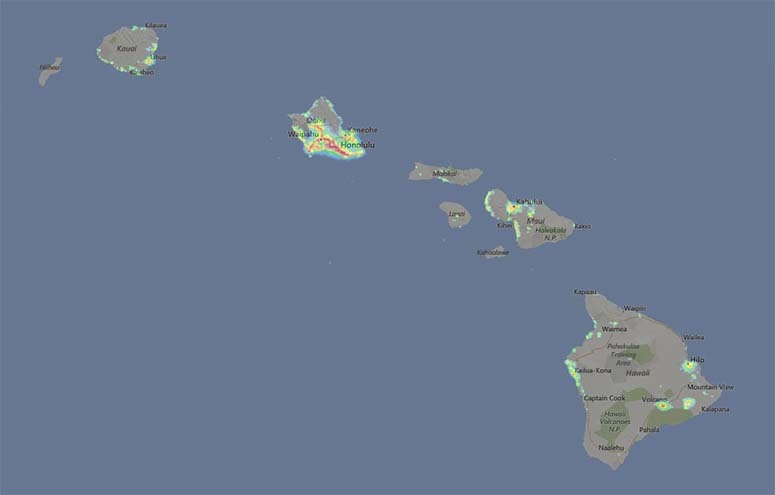 As you can see, O’ahu is the most polluted with light. Most of the other islands require a short drive from the glow of the town to the closest beach or field. But location isn’t the only thing that plays into the equation. Astronomical dusk starts about 1 hour after sunset. So as you watch the colors melt away, hunker down and enjoy the show. The stars will slowly start to come out (the first things you’ll see are probably planets). After an hour you’ll see more and more stars. You can get a clear view of the sky at sea level or at 10k feet above it. 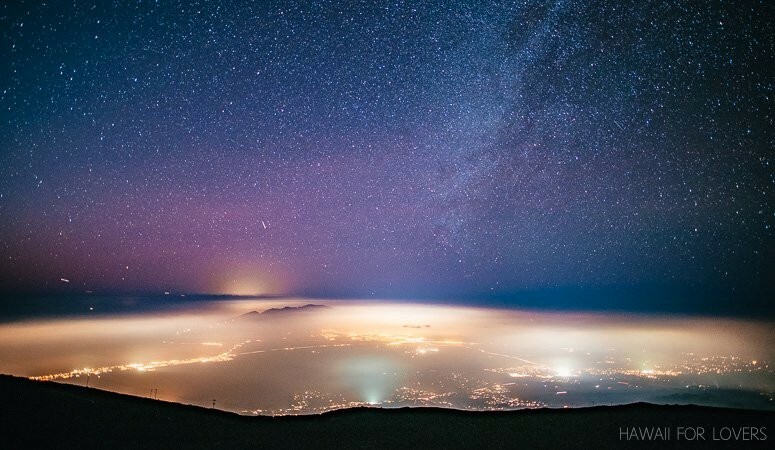 Being up high helps to remove even more of the glow of the city lights (and in the case of Haleakala and Mauna Kea, even get above the clouds themselves!) But you can run into issues with elevation sickness, etc; not romantic at all (we’ve been there!). Sitting on the beach and listening to the sound of the waves is also very romantic, so don’t pass that up. 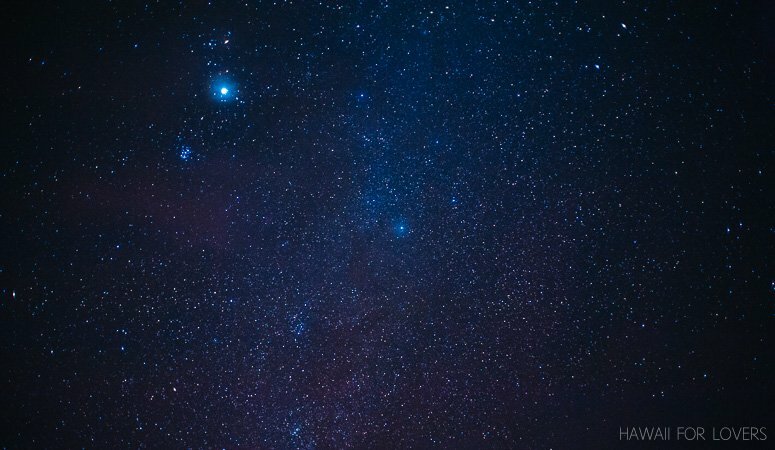 The Bishop Museum Planetarium offers programs showing what you can expect to find in the night sky the next few nights. There are various tours you can take for stargazing on Mauna Kea and Haleakala. Mauna Kea also has free stargazing at the visitor’s center every night (but it can get rather crowded up there). There are also a variety of stargazing apps available to help you know what you’re looking at. They can be found in the Apple App Store (and probably the Android App Store – or something similar). Sky Live is useful to see what the conditions are going to be (clouds and haze aren’t great for viewing), when the sun and moon (and various planets) are rising and setting, and even give you info about seeing the International Space Station. Apps like Star Walk 2 and Startracker will help you track the Milky Way, point out various constellations, and do so all with the ease of pointing your phone to the sky. They also let you skip ahead in time to plan when you might want to go out. I will often plan weeks ahead to make sure I am out when the sky is at it’s best. Just turn down the brightness on your phone when you’re using the apps. The bright light will mess with your eyes (even low it will, but not as badly). In a field, on a beach, on top of a volcano; the stars are out! The important questions to start with: when is moonrise and what phase is it in? A (mostly or) full moon rising a few hours after sunset will mean that stargazing might be best in the early morning. A new moon is best because it means there’s no extra light in the sky. Sometimes I find the moon will rise about 11 pm and that gives me a two-hour window from 9 pm to 11 pm to see things really well. If you remember back to middle school science, the Earth rotates on an axis that shifts throughout the year (hence summer, winter, etc.) and that changes where the stars are located in the sky (from our point of view, that is). 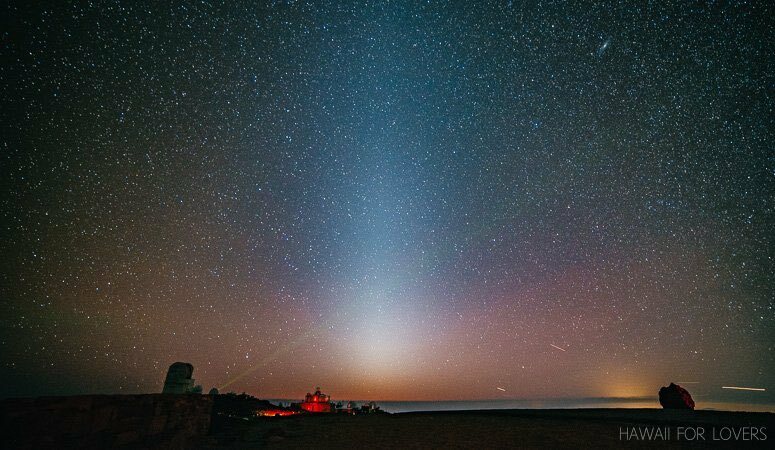 The short of this is to say the Milky Way is best seen overhead during the summer months. During the winter it tends to hang closer to the horizon. Same with certain constellations; they are more prevalent at different times of the year. The stars helped bring the early Polynesians to the islands. They had an understanding of how to read the sky. If you want to get in depth with the study of the stars and how they have played a role in the history of Hawaii, check out the book North Star to Southern Cross (affiliate link). And make sure to check out the programs at the Bishop Museum’s Planetarium. Make time for you and your beloved to get outside and enjoy the specs of light that make up this universe we call home!